On February 17, 2015, police officers from Alicante, Spain, were called by neighbors who heard the frantic cries of a dog. When the officers arrived they found a small dog in excruciating pain and an owner who said he had no idea why the dog was crying. The officers pulled the dog from the home and arrested his owner for animal abuse. The small dog is named Neymar and according to TeleCinco, the 29-year-old pet owner was sweeping glass when officers arrived at the home. The pet owner told authorities he had just gotten home and found the broken glass and the dog crying. However, a few minutes later he confessed the pet had run away a few weeks back and he had beaten the dog to teach him a lesson. Officers arrested the man and rushed the dog to a vet clinic where veterinarians discovered the dog had a broken leg and a collapsed lung. The dog was coughing up blood and needed emergency surgery to save his life. Neymar’s abusive owner surrendered him after he admitted not having funds to cover for the dog’s treatment. The officers who responded to the animal abuse call came together and paid for the dog’s surgery. 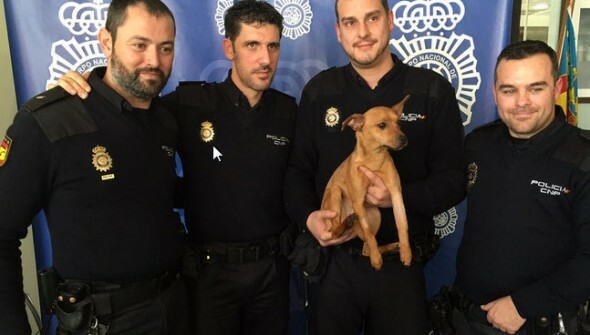 After the surgery, one of the officers decided to adopt Neymar, and once he was strong enough, the officer made the adoption official and took the little dog home. Neymar will never again be abused and he now has a band of police officer brothers looking out for him at all times. That is wonderful that the police save this cute dog from the owners and arrest for animal abused.